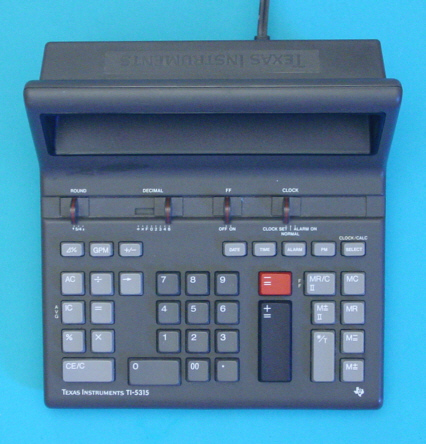 Texas Instruments introduced with the TI-5315 in 1988 the unique combination of a printer-less 12-digit commercial desktop calculator with a built-in clock. Compared with the TI-3510 introduced almost 15 years earlier, added the TI-5315 much more functionality into a slightly larger package. Dismantling the TI-5315 reveals a clean design centered around a NEC uPD75206 4-bit single-chip microcomputer. Taiwan, ROC as the contract manufacturer of the TI-5315. Texas Instruments continued the design language of the TI-5315 and introduced in 1989 the sibblings TI-5322 and TI-5332 sporting a printer but missing the clock. The TI-5315 is featured in the Texas Instruments Incorporated bulletin CL-982 dated 1988.